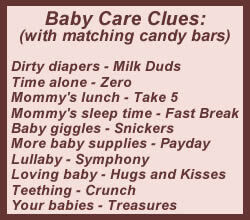 Using candy baby shower games is a great way to add life to your party. Everyone loves a bit of the sweet stuff, and with our list of clever games you're sure to find something that will be just perfect for your guests. Sometimes when you gather friends and acquaintances together for a lovely celebration, the atmosphere can seem a bit stilted and uncomfortable at first if the guests don't know each other well. No problem! A baby shower candy game can be an ice breaker that gets everyone smiling, laughing, and chatting amongst themselves. We have an ever growing list of candy games for you to browse. If this particular candy baby shower game doesn't suit your taste, you're bound to find one amid the others we have available. 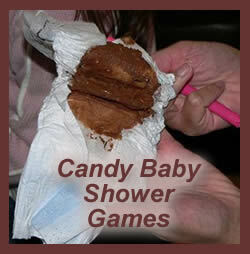 Yes, we even have a page explaining how to play the dirty diaper candy game, which is always a big hit! 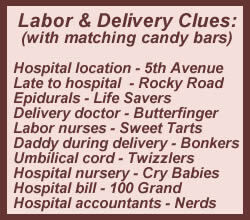 The baby shower candy game that I want to cover in this article is a candy matching or guessing game. You can choose to play this game in three different ways - choose whichever suits your time, space, and guests. Basic/Simple Version - Pass out pen and paper to each guest. 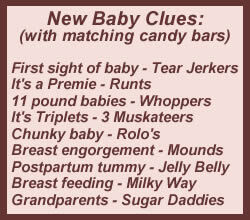 Read out the clues and give them a set time to come up with a candy bar name that could relate to the clue. When the time's up, read out the correct answers and so who came up with the most correct guesses. You can also give points for clever alternatives that people come up with. Intermediate Version - Make a list of all the clues in one column and all of the candy bars in a second column (scramble the second column or rearrange the order). Print out enough copies so you have enough for each guest. 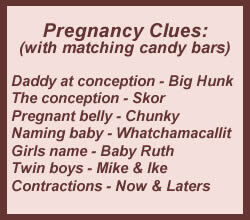 Pass out the lists and give the guests 10 minutes (or so) to match the clues with the appropriate candy bar names. Read out the correct answers and see who got the most correct. Advanced/Active Version -Write the individual clues on white 3x5 cards and the names of the candy bars on colored 3x5 cards (You can use white and colored paper if necessary). Shuffle the cards and pass them around. Give the guests instructions to mingle and find the person who has the clue/candy bar that matches their own card. At the end of a set time, read out the clues and give the correct answers and see how many found their match.